Warning! 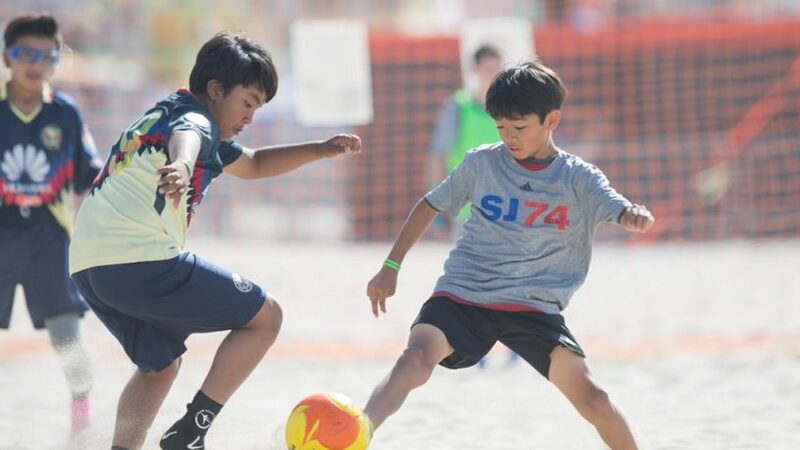 This is an opinion piece which dives into many of the annoying factors having a clear understanding of beach soccer, and in particularly sand training is beneficial for developing elite soccer players. So often speaking with my grass counterparts and peers I am told ridiculous things like it, “It’s fun but doesn’t do anything to improve your grass game”, or not realizing they are simply missing the boat when it comes to improving their teams both physically, mentally, and skillfully in ways you cannot have imagined without exposing yourself to it. Not only that but faster, more efficiently, and more completely compared to those who only touch a ball on a solid surface. Doubt this or not you will not by the end of this. Facts are facts! Being in the space promoting a philosophy and an alternative futbal game can be daunting at times. You deal with so many types from the dinosaur to the young overconfident students of the game who have read all the latest articles. There are plenty more who cannot see outside the box which measures 80 x 110. Due to the excuses and negative comments for avoiding it you really have to examine yourself, and what you are saying much more critically because you are forced to examine if you are making sense. 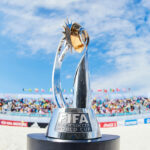 You run the gamut into the many excuses and reasons coaches choose to avoid playing in beach soccer tournaments. But it is sometimes annoying to see the length they go to show how actually ignorant they are. Going out of their way to give excuses which fundamentally shows their lack of information in some cases is alarming. 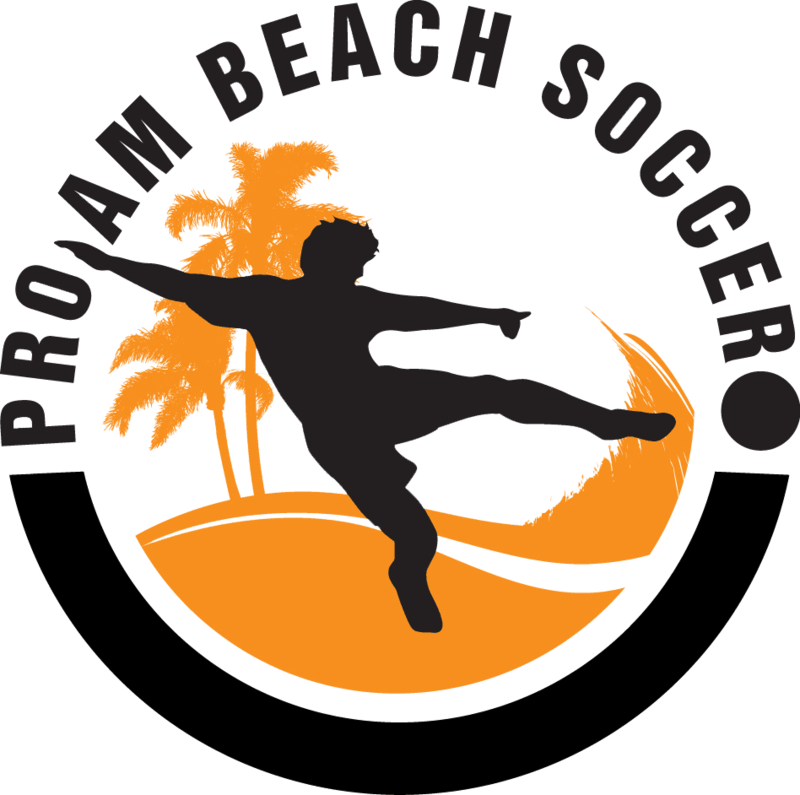 Coaches who don’t want to for whatever reason have often said it because they are worried about an injury to toes or they are worried about sprained ankles and knee injuries in the sand. This makes me laugh because what little scientific data out there says the opposite. Whether you look at the Impellizzeri FM etc. al. Study: English Premier Players (2008) or my new found hero’s at Western Australia University, Dawson & Pinnington as well as PH.D. Theses work of Martyn John Binnie, they all come to basically the same conclusion. Training/Playing in the sand not only makes you more agile, fasters, stronger, but also allows you to do it without as much soreness. The WAU scientific study literally concluded you get aerobically fitter 1.5 faster, and anaerobic fitness is achieved 2.5 times faster. At the same time, Impellizzeri concluded those in sand compared to turf doing 4 weeks of plyo’s were considerably more improved in the sand in both speed and jumping while also experiencing considerably less soreness. My favorite excuse is they are worried they will break their toes. Whereas playing barefoot takes away a sock and barely few millimeters of leather, or these days more accurately some form of recycled plastic, it is not much protection at all. The reality is the players are not being taught to kick properly and the injury more times than not is turf toe. This caused by the player’s big toes dragging in the sand as they strike the ball. Consider this analogy. You want to strike someone as hard as you can. Do you do this with your fingers extended and striker the individual with your whole body behind it? Of course not, you make a fist, lock the wrist, and then follow through with your whole body. Doing the former would hurt yourself. Now think of this in conjunction with your foot. When you as a coach or player you, of course, think about locking your ankle. But have you ever been taught or thought to curl your toes inside your boot? Well, when on the beach that is exactly what a coach must teach their players. Curling your toes like your fist allows you to strike through the sand as hard as you want, with practice, without inflicting any pain or concern for the dreaded turf toe. If it does drag, it doesn’t snag, and suddenly if you develop this habit when you go back to putting on your boots you suddenly have a more rigid and strong locked ankle and far stronger opportunity of striking the ball with greater velocity. It’s striking with a fist instead of an open palm. To be honest, this part could go on and on proving nay Sayers incorrect, but then there wouldn’t be any time to attention span by most readers to speak about the benefits to their actual play. In a day and age where for more than the last decade coaches have been enthralled with the Tiki Taka of Barcelona. Don’t get me wrong, Spain style of play has been entrenched in me since the ’90s and my style of coaching has always been within the simplicity and grace they as a nation and Barcelona, in particular, has displayed. But, this takes away one common factor which has to be addressed and is not more so now than ever. We are not training or teaching players how to address a ball in the air leaving player uncomfortable addressing this essential part of the game which happens anytime a player is under pressure. How many coaches have made the statement, “If in doubt kick it out and up” always away from pressure. The ball is in the air a lot and less and fewer teams are addressing it. 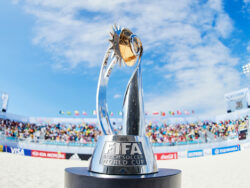 Beach Soccer is the perfect balance for coaches and players to address this problem. If you don’t know why, it’s because it’s always played in the air, if done and coached properly. Every touch, scoop, throw, and kick is either to take a shot on goal or a few passes away from setting up a shot usually taken out of the air. We are talking about a game which averages a shot every 30 seconds and 9 goals a game. Also, coaches are always telling their players to get on their toes. They do strength & speed training exercises on hard surfaces for speed and agility which many times leads to an assortment of injuries as joints, bones, and tendons are pounding in quick efforts. Whereas if you simply put your players in the sand and told them to “run like they were in high heels” with toes entering first and heels always up they would simply develop the muscles naturally making the players feel like they are floating on top of the turf when they return. This is not rocket science. It’s not even close to all the facts. “Owed his talent to playing on the beach, because there is where he grew his talent. 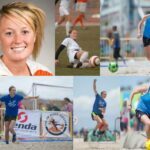 Beach Soccer requires a lot of technique, and this helps any soccer player grow”. 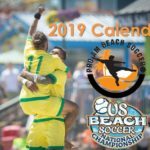 “Beach soccer is not about the beach, but about the sand, meaning that beach soccer can be played all over the world regardless there is a beach or not. It is a universal sport, anybody have access to”. 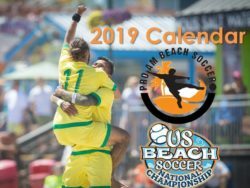 King Eric believes in beach soccer so much that he bought the rights of beach soccer from the French Federation and player/coached the French National Team to victory at the very first FIFA Beach Soccer World Cup in 2005. Also taking part in that tournament were other stars like Brazilian Legend and World Cup Champion Romario. This is simply an opinion piece getting a few things off my chest and onto paper for the world to see because simply telling people one at a time or possibly as many as a few dozen during clinics and presentations is just not working fast enough. This information needs to be seen and it needs to penetrate the hard skulls of many because whereas futsal has been around a very long time only in recent years have we seen it become everyone’s new favorite flavor for skill development. It is great for players, but a lot of dinosaurs had to have their craniums cracked and a new generation needed to have been exposed to it for a decade for it to grow its wings. 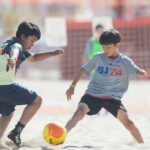 This is the same with beach soccer, but we would like to see us learn from the mistakes in treating futsal lightly for so many years until YouTube exposed the mastery skills of Ronaldinho. It was about this time when people went, duh, that’s why he is so skilled. Funny thing is this is a guy who currently has a beach soccer field built in his backyard. Makes you think, doesn’t it? In some ways, it would be fitting for the self-professed “Commission of Football” Eric Cantona to go on one of his verbal assaults calling out all those nay Sayers to the sand training module. Do you hear me, Eric? It is prime and ripe for you pick up and run with. I can see it now, King Eric, assaults all the coaches of the world who cannot see the forest through the trees exposing so many who would doubt the benefits of getting their players feet in the sand. They must have sand in their eyes, someone get them the water bottle to spray it out, and let’s get back to improving our players and quickly making them elite through exposure to sand. Do you now understand all the Naysayers trying to stand their ground on turf are actually standing on something so malleable they didn’t realize they were standing on the sand all the time already? Now own it, teach it, and improve your players.